On the eve of Valentine's Day, I am thinking of odd matches: They shouldn't work, but they do. Maybe that's been you life; it is so in mine. My Valentine is more introverted, less frugal (well, not frugal at all), and reads things I don't touch: science fiction, paleo-archaeology. He will not eat corn and is iffy about the other vegetables; I could live on them. Some couples are neatly matched as bookends, others, a human odd-sock collection. You might know some of each. 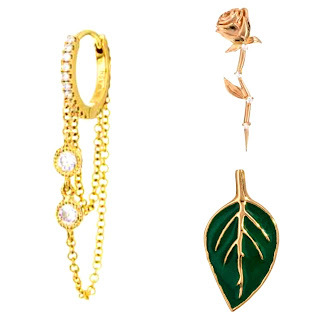 The art of jewellery is similar, and if there is one item that will enliven a jewellery box, it's a pair of deliberately and insouciantly mismatched earrings. Look closely at mismatches; unlike buying a standard pair, you have to evaluate both. Sometimes I'll see that that one earring works, and the other is only along for the ride. Ideally, each sparks ithe other. Janis makes some of her most striking designs by commission, when clients bring bits and pieces. She shared these commission images. I'm always trying to spot the original elements. Left: In my imagination, someone owned a pair of small ruby studs, and wanted more drama—good drama, not the I'm-leaving kind. Right: Perhaps the pearls, and the small round diamonds were the starting point. 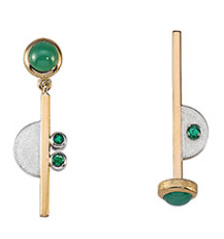 If you have 'outgrown' small earrings, here's a route to an exciting new life. Mismatches can be marriages of found bits and pieces, like Edinburgh-based Grainne Morton's repurposed vintage elements, which she combines in quirky new designs. 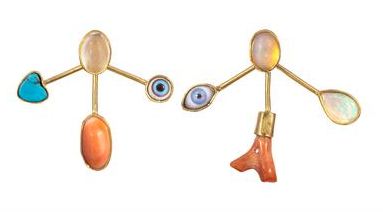 These jacket and post earrings (the jackets are detachable) are made of coral, moonstone, and turquoise; price $US 450 at TwistOnline. Pearls' organic shapes suit mismatches; these glowing pink and ivory keshis are mated to jade sticks, an elegant pairing much like two remarkable persons who found one another, perhaps while hiking in Japan. 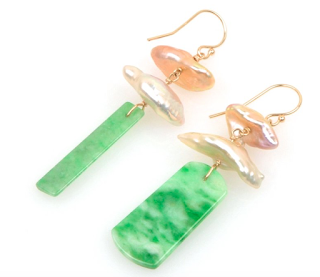 Temple jade and pearl earrings; price, $US 360, from Kojima Company. High jewellery has long favoured the mismatch; meet a couple of swells. No one does haute like Hemmerle, whose signature is unconventional materials presented with audacious mastery. 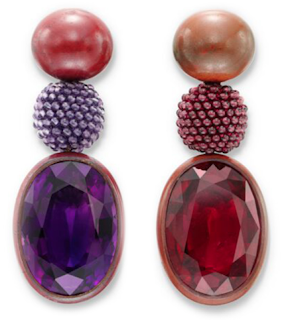 Hemmerle earrings of beaded amethyst and garnet, and rubellite and amethyst oval faceted drops; price, $US 85, 000 at FD Gallery. Eye-catching mismatches don't have to be big and fabulous, but I am convinced they look best in real materials. 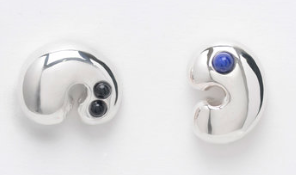 Los Angles jeweller Leigh Miller makes these sterling Doodad earrings set with lapis and onyx; price, $US 240. You could also wear two separate earrings that relate, which is a mismatch too, but differs from a composed pair. The look works when one earring is current, even edgy. The benefit is that you can wear a pair, and sometimes un-pair it by choosing a different, separate earring. 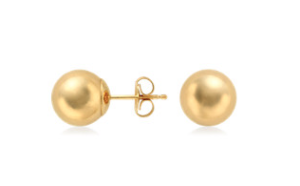 Let's say you have 8mm 18k gold studs, and they sit by your side like that sweetheart who was really nice, but already middle-aged when you were twenty-six. Send one on a separate vacation. Either buy an unusual single or have something made, maybe redesigning a single earring whose mate wandered off at a party, fourteen years ago. Geez Louise, you may think, I'm spending more on a single than I would on a pair—but trust me, you want something a little offbeat to liberate the gold ball. If you aren't sure, try living together first: borrow a friend's (earring, not sweetie!) for a weekend. Your jeweller may also permit a test-wear. Don't ask your most conventional girlfriend what she thinks or abandon the idea if she asks if you got dressed in the dark. Some persons just never get who we want to be with. Like relationships, you at some point make the How Long assessment. If you think it's for the long run, buying a pair of composed mismatches is a lovely leap, but because they don't blend into the scenery, you'll want to be sure. They are harder to find, but I am seeing more "odd couples" now than I have for the last twenty years. Look for harmony, wit, and expert craftsmanship. In love or jewellery, who wants to settle? I love the mismatch of earrings. 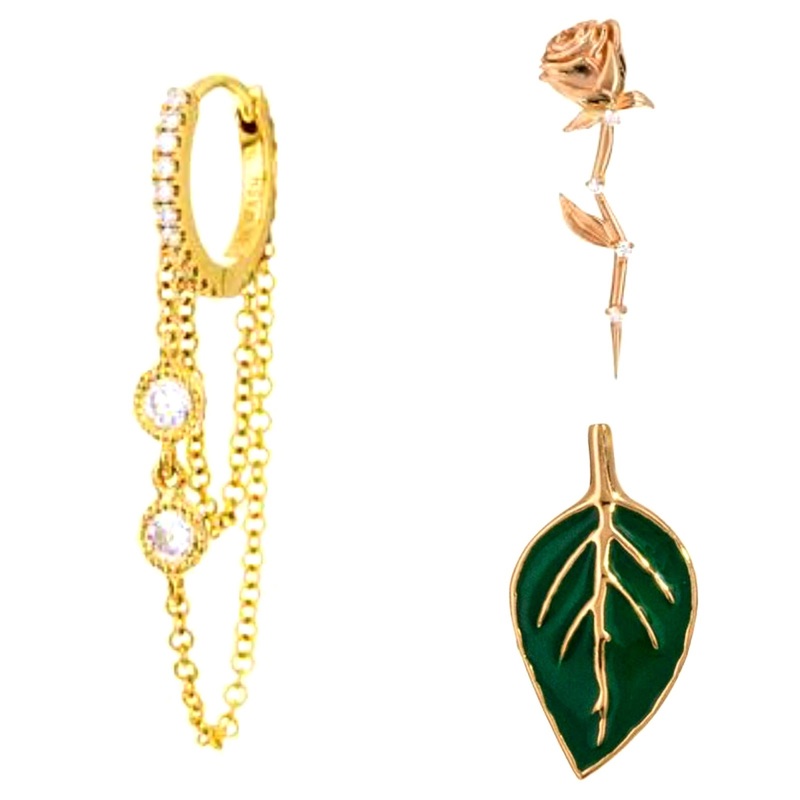 Many years ago my husband bought me a pair of gold button type earrings, one was a shape of a flower and the other the leaf. Since then I have taken some of my other earrings and mixed them up. Granted some worked well others not so much. Mismatches of all kinds can be great fun. Thanks for the lovely examples. Love the pearl and jade - gorgeous. The Janis Kerman site is so much fun. I would love any of the earrings and most of the necklaces that she shows. I went to Venice many years ago and bought Murano glass earrings for a group of 6 women friends, trying hard to match earring with personality. All were beautiful, but I chose a mismatched pair for the quirkiest and most avante garde among us. She thanked me for the mismatch and for acknowledging her individuality. It is a safe bet that my husband will never buy a mismatched pair for me, but that won’t stop me from buying for myself. Thanks for the post. I've always wanted to have mismatched earrings, taking inspiration from you, Duchesse. Hope i can find the right design and material. I have 3 sets of colored stones - blue sapphire, ruby, emerald, small ones, 3 of each color, maybe good for earrings and pendant. Any suggestion, and thank you for the post...! Dulce Young: You will need to take the stones to a jeweller who is a very good designer- and whose designs you like. 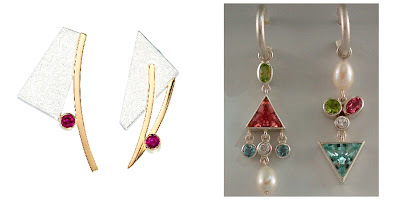 See my posts (there are many) on restyling jewellery, because essentially that is what you are doing. - Resist using all the stones in one project just because you have them. Sometimes you need to add a stone (or pearl), or use only what works for the design. I saw a really sorry-looking pendant made because a client insisted on using all the stones she had bought on a trip to India in one piece. - On the other hand, you might need to add some- see the second pair of the two-earring Janice Kerman photo. I am pretty sure she added some stones, besides what the client had. These need not be costly. - I'd avoid an earrings-and-pendant set, it is dated. But you could use some stones for earrings, some for a pendant- but they should look different- not a parure. - Look at examples of mismatched earrings and build your own scapbook or Pinterest board- really helps to clarify what you want. 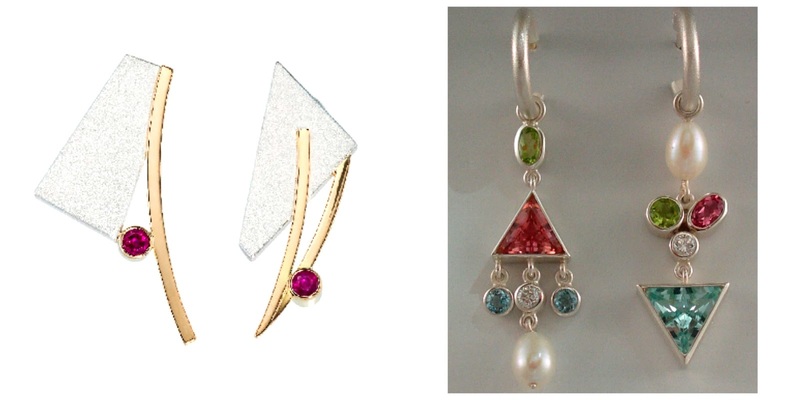 Some mismatched earrings are subtle and others, like the Grainne Morton pair, are eccentric and very visibly different. There is no "right", just what you like. If you see some you like, find out if that jeweller takes commissioned work. Nice project to think about! Leslie Milligan: That is a wonderful, generous travel gift! I am sure they were touched and if they knew one another it would be fun for them to see what earrings you chose for each one. For some reason, most men do not think of mismatched earrings, perhaps because they think our ears match, so our earrings should. AnetteAK: It's fun to see who gets that you did it deliberately and who doesn't!